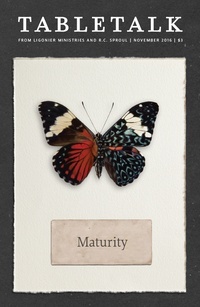 The November 2016 issue of Tabletalk will consider the biblical-theological theme of maturity. Maturity is a combination of wisdom, kindness, and endurance—a “growing up” in love. Compared to our forefathers in the faith, many of us are lacking in maturity. Yet, the progression from spiritual infancy to maturity in Christ is the normal progression of the Christian life, and helping others grow in the “fullness of Christ” is one of the primary goals of the church. The goal of this issue is to counter immaturity in the church by presenting a more compelling account of biblical maturity. Contributors include R.C. Sproul along with John P. Sartelle Sr., Dan Dumas, Tom Ascol, Mark E. Ross, R. Kent Hughes, R.C. Sproul Jr., Brian Tallman, R. Albert Mohler Jr., and Jerry O’Neill.